The Eight Forty Apartments are a breath of fresh air for anyone looking to enjoy the Texas urban vibes of Midtown and the scenic beauty of San Antonio’s rivers and parks. With 10- to 12-foot ceilings, floor-to-ceiling windows, concrete floors, unbeatable SATX views, and top-tiered community amenities, apartments have never felt so different. At The Eight Forty, you don’t have to choose between urban convenience and suburban comfort — you get to enjoy the perfect balance of both. Enjoy the views of San Antonio from your massive windows. Easy to clean and style, each unit comes with beautiful concrete flooring. 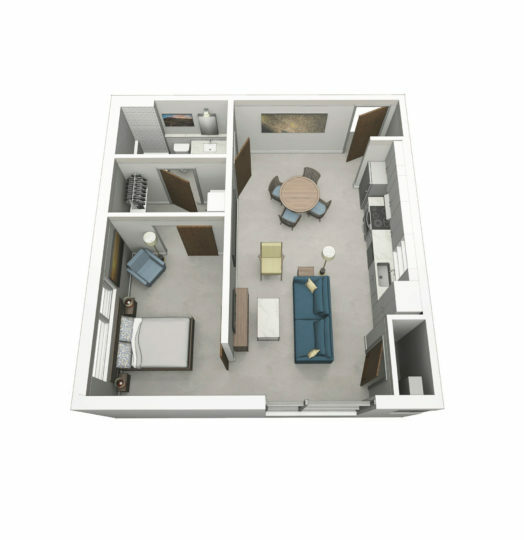 10- to 12-foot ceilings give already spacious units an even bigger Texas feel. Enjoy peace of mind with controlled-access units. 7 minutes to downtown, 3 minutes to the Pearl, and walking distance to SATX’s main hotspots. Spacious and modern one-bedroom apartments designed for professionals in the Midtown San Antonio area. $199 move-in special includes application fee and deposit. Certain restrictions apply. See office for details.